Christmas Morn | Holiday Ponies Figurines | One Price Low Flat Shipping! 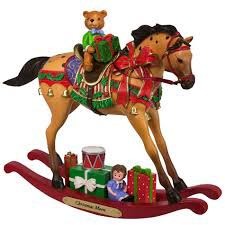 From the Trail of Painted Ponies Holiday 2017 Dillards Exclusive, Christmas Morn' Rocking Horse Figurine. Designed by artist, Laurie Cook. Made of stone resin. Measures 7.5" tall. This delightful rocking horse was available only at select Dillards stores, with very few produced.